Retailers are scrambling to adapt to expectations of today’s customers and must be enabled by modern order management systems. Smart use of mobile technologies can help retailers make store managers and associates more efficient, effective and productive in performing both customer-facing and operational tasks. Executive summary highlights from a global survey of 200+ CXOs on key digital transformation imperatives. This week: Footwear retailer launches AR-enabled shoe, retail giant adds 4000+ robots to manage in-store tasks and home improvement retailer introduces a floor-visualization tool on their website. This week: Apparel retailer enables associates to share shoppable Instagram posts with customers, retail giant adds voice commerce for grocery shopping and social media app adds AR utility feature to their camera. This week: Pizza chain plans to add a feature that lets customers place orders via their cars, retail chain uses artificial intelligence to optimize inventory management and beauty retailer redesigns its website for modern shoppers. This week: Coffee chain adds a feature that lets customers track coffee ingredients, shoe retailer optimizes store shipping using artificial intelligence and social media app launches in-app checkout. This week: Specialty retailer starts answering queries via text message, social media app launches Snapchat-like camera feature and beauty retailer launches its first credit card. This week: Supermarket retailer offers real-time status of deliveries, off-price retailer launches an interactive omnichannel game with Instagram and search engine offers a new feature to purchase from image search results. This week: Courier delivery service tests autonomous vehicle for same-day delivery, handbag and leather goods retailer launches its first mobile app and retailer launches project to fight fraudulent product listings. This week: Retailer pilots AR tool that lets shoppers test hair color virtually, Beauty retailer launches AI-powered tool for skin diagnostics and Mapping app rolls out "Follow" feature for iOS users. With the growing influence of mobile technologies on the retail shopper journey and new operational complexities of the digital store, retailers are re-evaluating their misbeliefs about investment in associate mobile technology. The No BS Retail Outlook 2019: A Pragmatic Take On What Will Matter Most, And What You Should Do About It. A pragmatic take on what will matter most in Retail 2019 and what executives managing digital transformation for their organizations should do about it. This week: Retail giant collaborates with film studio to provide VR experience, Grocery retailer introduces a new payment solution and Diamond retailer launches an in-store AR feature to try ring styles virtually. This week: Tea retailer rolls out guidance app for employees, Eyewear retailer launches AR-based virtual try-on feature and Supermarket retailer launches an app to promote soon-to-expire products. This week: Retailer pilots voice-activated shopping assistant in aisle, Gift retailer adds voice commands and chat services, and sportswear brand unveils self-lacing shoe. 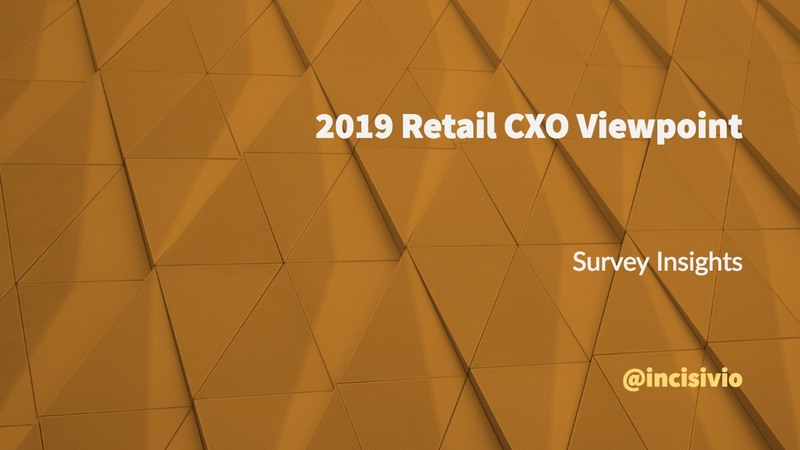 As the retail landscape broadens and shoppers demand exceptional experiences, retailers must transform rapidly and execute flawlessly or risk becoming irrelevant. The definitive reference guide for the retail transformation pragmatist. An annual reference guide for the retail transformation pragmatist. The guide is based on insights from 6500 US shoppers, 1000+ senior business & technology decision makers and 300+ innovative retail enterprises. This week: Retailer uses video game app to train new associates, retail giant tests small autonomous delivery robots and apparel retailer deploys AI to help shoppers complete their look. 5 Requirements for Successful In-Store Digital Experiences. For many retailers, the future hinges on successfully transforming stores through digital experiences. Increased technology investment alone, however, will not guarantee success. Findings and analysis from the survey of small to mid-market (SMB) Industrial Machinery & Heavy Equipment (IMHE) executives who are involved in the product lifecycle management in organizations in the US, UK and Germany. The retail industry is poised to make the greatest increase for in-store investments since 2007. Even with these planned increases, most retailers still lag shopper expectations. This week: Grocery retailer launces unmanned delivery service, Fabric company offers more customization with new 3D solution and social media app launches new feather called Lens Challenge. This week: Retail giant launches in-store ordering app for employees, Supermarket chain unveils AI-powered medical clinic and financial services company launches 3D-based virtual store experience. As retailers invest in-store digital experiences, they must avoid costly failure by focusing on 5 key imperatives. This week: Social media company rolls our dedicated shopping channel, Retailer launches a new mobile app-based marketplace and Sports Retailer partners with Ticketmaster to sell tickets and apparel. This week: Retailer launched feature that lets children play with holiday toys virtually, Sports retailer debuts high-tech immersive store in NYC and social media app launches features of holiday shoppers. New product development is critical in today's environment, yet failure rates remain way too high. Digital Twin technology holds promise to lower costs, boost profitability and enhance product success rates. This week: C-store giant launches pilot program for mobile checkout, Supermarket giant launches mini robot supermarkets for online orders and Apparel retailer launches dedicated worldwide online platform. The stakes have never been higher for retail and consumer products companies to improve their success rates with new product development. The stakes have never been higher for industrial manufacturers to improve their product lifecycle management processes. Findings and analysis from the survey of small to mid-market (SMB) Consumer Products and Retail executives who are involved in the product lifecycle management in organizations in the US, UK and Germany. This week: Fast-fashion retailer adds app to connect employees, Beauty retailer revamps loyalty program and social media company launches software to bring AR masks for streaming & calling services. This week: Furniture retailer launches loyalty program, Grocery chain launches marketplace for hard to find food items and Department store expands VR furniture shopping to more stores. Recent research from Incisiv and Windstream/BRP show that retailers are actively investing in digital initiatives across the enterprise, yet they still face challenges across many areas. Finding and analysis from a survey of retail executives managing in-store technology and operational strategies in the USA. Key shopper expectations are driving the need for retailers to re-assess their pricing (and re-pricing) capabilities. This week: Furniture retailer launches app to design rooms via mixed reality, Retail giant enters partnership to offer in-store services and social media company enters smart speaker market. This week: Social app launches feature that links with Amazon, Magazine partners with Perfect Corp for first print-to-digital experience and Luxury brand launches immersive experience. This week: Retail giant set to launch VR training in all stores, Department store adds in-store tech to enhance shopping journey and social app launches features to make it easier to shop. A look at how retail innovators are addressing the 5 key expectations of a modern shopper, and what this means for retailers in terms of their pricing and promotion capability. This week: Cosmetic brands offers web-based virtual makeup try-ons, Storage retailer deploys in-ear voice tech with smart appointment scheduling and C-store giant accepts mobile payment across US. This week: Retail giant tests crowdsourced delivery, Apparel retailer launches fashion partnership to deliver video content and furniture retailer set to launch 3D imaging app. This week: Retail giant extends Handy services for online customers, Retailer launches app to assist visually impaired customers and retailer adds hands-free to improve customer service. This week: Fast-fashion brand launches AI powered visual search, Retailer partners with selfie app for AR fragrance campaign and Apparel retailer opens tech-centric store. This week: Apparel retailer uses AI to automate call centre, Furniture retailer launches platform to connect designers with customers and Apparel retailer launches new site and app. This week: Furniture retailer debuts mixed-reality commerce experience, Apparel retailer launches announced integration with Venmo and a video Q&A app for celeb and public figures. Learn from Albertsons, IBM, and Cherry Advisory as they detail what it takes to win the war in today’s stores. This week: Retail giant pilots technology to fulfill online grocery orders, Apparel retailer launches in-app chatbot for personalized style tips and Apparel brand unveils chip-embedded clothing. New shopper imperatives are dictating how retailers should engage with their customers. Digital technologies can drive big benefits for retailers as long as they understand which initiatives their customers value. This week: Retailer launches visual search capability, “Part Finder”, Retail giant partners with Waymo to pilot driver-less BOPIS and social media app adds voice messaging. A fireside chat with leaders from Boston Retail Partners and Windstream as they share how guest expectations are pulling the restaurant industry to invest in improving the dining experience. This week: Retailer launches new app that helps customers shop healthier, Retail giant adds emoticons to self-checkout software and Social app adds feature to show if a user is online. Digital technologies are requiring retailers to reinvent their store strategies as consumers demand convenience, flexibility, and speed. The next generation of diners are forcing operators to rethink their digital strategies. This week: Social app tests AR ads in news feed, Grocery chain launches grocery platform O Organics Market and Retail giant launches app to connect designers with potential customers. This week: Luxury retailer pilots smart store, “FashionAI”, Big box retailer plans to add automatic cash-counting machines and Social app launches commerce feature for influencers. This week: Retail giant introduces 3D virtual shopping tour for back-to-school shoppers, Specialty retailer launches tech-savvy next-gen store and Retailer tests driver-less grocery delivery. Digital is greatly impacting guest behavior and operators are scrambling to close the execution gap between guest expectations and technology capability. This week: Discount store tests mobile checkout, sporting goods retailer offers digital receipts and apparel retailer’s outlet launches e-commerce website. This week: Retailer tests voice-activated mirrors, QSR launches prepaid card with reward twist and social media app adds feature that lets users un-send messages. Leading retail innovators are reimagining their brick-and-mortar stores in the age of digital-first customer experience. As other retailers follow suit, they should emulate leaders in more than just intent. This week: Clothing retailer offers buy-now-pay-later option, eCommerce retailer launches new personalization tool called Interests and retailer rolls out subscription service for tech support. This week: Wholesale retailer launches BOPIS for all its stores, Healthcare retailer launches online skincare analysis tool and social media app launches feature to make reservations. This week: Wholesale retailer adds wish list feature, social networking service begins limited rollout of in-app payment and regional coffee chain adds mobile ordering. Holy Alibaba, WalMart for the Win, and Other Musings from the Global Retailing Conference. The retail industry proves it’s up for the challenge of the retail revolution as it addresses the next generation of retail leadership. This week: Sneaker brand launches online virtual sneaker store, pizza chain's virtual assistant starts taking phone orders and retail giant launches car delivery feature. As retailers evolve stores from being destinations of commerce to becoming exciting hubs of customer experience, store teams need to contend with greater operational complexity. This week: Shoppable storefront window technology, store-as-a-service platform and self-destructing feature testing in email. This week: Beauty retailer's curated retail truck, coffee giant's voice ordering feature and social channel's new group video chat feature. The Future of Stores: How, Not How Many. Retail innovators are redefining the role of brick and mortar stores in the context of their overall business model and customer experience. Four retail upstarts offer valuable lessons to larger retailers weighed down by legacy. Are Retailers Truly Committed to Delivering a Best-in-Class Customer Experience? Customer experience is intricately linked to, reliant on and powered by retailers’ frontline associates. Why, then, do retailers struggle to empower them with the right tools, training and incentives? This week: Mobile app that acts like social network for book lovers, app to help dealers close sales initiated online and feature to make it easier to share key moment from a live video. This week: E-commerce retailer's AR feature to determine shipping box size, Department store's mobile checkout expansion and Grocery retailer's digital marketplace. Supercharging Restaurant Performance Through Analytics: The Time to Build a Better Mousetrap is Now, or Never. As small and mid-size restaurants face new competitors, strive harder to please customers, and strengthen digital operations, they must utilize focused insights to improve business performance. This video highlights the real cost retailers pay by not enabling their frontline workforce with modern tools and training. This week: Mobile Augmented Reality experiences in apparel store, TaskRabbit furniture assembly service and in-aisle mobile checkout. Is the Marketplace Model Set to (Again) Disrupt the Future of Brick & Mortar Retail? As retailers struggle with excess capacity, too much product, and a need to enhance the customer experience, it’s time to experiment with new (and old) ways of doing things. The marketplace model just may be that way. What’s Holding Retailers Back from Investing in Their Frontline Workforce? Retailers clearly associate an excellent employee experience with the ability to deliver a great customer experience. Why, then, do only 1 in 10 adequately enable their frontline workforce with tools and training? This week: Retailer's new delivery confirmation method, Social channel's feature to save posts for later and big box retailer's first technology incubator. The average retailer is shy about investing in technology and training for its frontline workforce. This week: Retailer sells sneakers on Snapchat, Retail giant launches new digital home furnishings shopping experience and social channel offers replay privacy control. This week: Home improvement retailer's job app, apparel retailer's reality YouTube series and smart speaker's new integration with smart TV. A fireside chat with three solution provider executives on how they partner with their clients to remove friction in the technology life cycle for a mutually beneficial outcome. This week: Home improvement retailer's VR-based training, 'shoppable stories' on Mashable and Retail giant's new in-store features on mobile app. A retailer with $1B in annual revenue loses $110M annually by not enabling its frontline workforce with modern technology and training. Retail innovators are redefining the role of brick and mortar stores in the context of their overall business model and customer experience. Here’s a look at 4 retail upstarts, and the lessons they offer larger retailers weighed down by legacy. This week: Smart speaker adds feature to send voice activated text, digitally-focused pop-up store and supermarket tests AR based glass technology. Beyond the obvious implications on customer experience; the cost, productivity and conversion improvements that an enabled frontline offers should be hard for retailers to ignore. 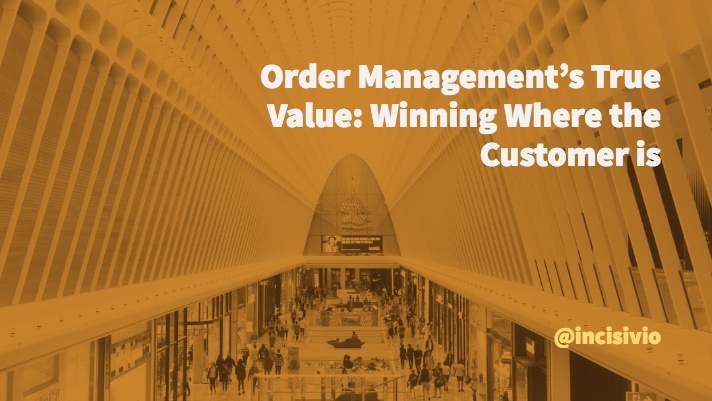 Profitable Omnichannel Order Fulfillment Remains Retail's Elusive Holy Grail. This week: Retailer offers online order tracking via text, voice & call, Supermarket giant's ads tracking capability for brands and tool to allow anyone to publish local news, stories and events. This week: Retailer's technology that displays price & nutrition, coffee giant's cashless store and new visual skill for Amazon's Echo Show. This week: Tech giant's patent for blended reality mirror, supermarket store's tech for queue management and social channel's new feature" A Look Back at 2017"
Incisiv's Gaurav Pant sat down for an informal chat with Avanade's Melissa Sherrard and Aaron Reich to get perspective on Incisiv's global survey on emerging technology in Retail. This week: This week: C-store testing on-demand ordering, Retail giant launches e-gifting feature and grocery retailers introduces Chat-to-Cart tool. This week: Retailer partners with video app to drive online orders, pizza chain's kiosk format and AR based holiday-themed smartphone filters. Incisiv’s resident road warriors arrived at Starbucks’ Reserve Roastery & Tasting Room in Seattle for a quick visit. I sat down with them soon after for an informal chat about their experience. This week: shopping assistant tool for marketplace, virtual necklace trial on Snapchat and voice assistant's new feature for businesses. This week: gift-themed messenger chatbot, AR feature that allows 3-D interaction and Secret Santa-a personalised gift-giving tool. This week: C-store launches chatbot, social channel's variation of QR code and tool to connect buyers and sellers in real time. Stores still matter. 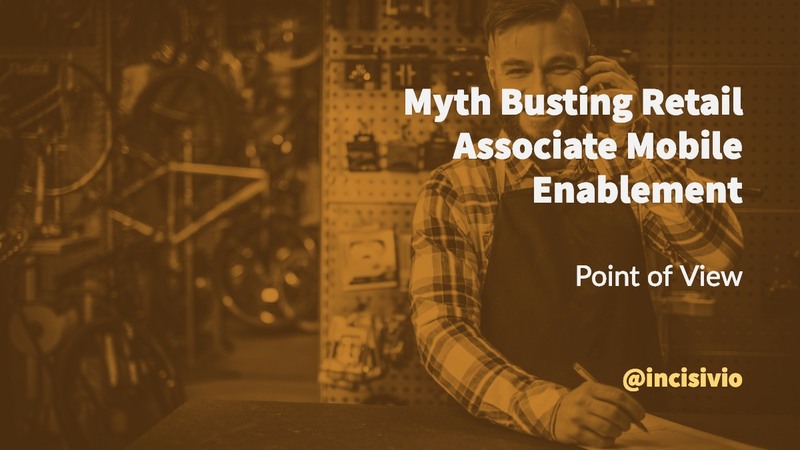 Does the store associate still matter? A look at how technology and the store associate factor into today’s store environment. Notes from my visit to Apple’s latest “town square” in Chicago, and from experiencing the launch of the world’s most anticipated “mass-luxury” product. This week: Online giant's AR feature, myCheckout app for store employees and digital gifting tools for holiday season. Amazon is often referred to as a disruptive force in retail. Yet, 2017 saw its greatest push towards multi-industry dominance. Here are the 4 industries Amazon has disrupted this year alone. This week: Robots to restock store shelves, live navigation inside mall and new AR feature "See it in your space". People are the core of digital transformation. “Digital” is more than selling stuff on the web. The core of retail needs a gut rehab. This, and more in my recap of SAP’s 2017 Retail Executive Forum in NYC. This week: social network's 'Order food' feature, microwave technology for custom midsoles and mobile express returns. This week: "Digital playground" with AR app, wholesaler testing driver-less cart in warehouse and cashless kiosk-only burger joint. While many of the well-established leaders in the digital space had a presence at Shop.org, the more exciting component was seeing the small and mid-sized ‘start-ups’ that are out to disrupt the way things have typically been done. Shop.org – Digital Darling or Digital Dud? NRF’s Shop.org 2017 just wrapped up in LA. Like Retail, the event is undergoing a transformation; Do the 'customers' have the patience to wait for the show to adapt? This week: Live delivery tracker, big box retailer's integration with Pinterest's Lens & VR shopping app for jewellery brand. This week: in-store location technology, "My Little Paris Tapage" app for flagship store launch and home delivery directly to the fridge. This week: Furniture retailer's AR app, social channel's new ad format 'Lifestyle templates' and video review feature on map. This week: 'Smile-to-Pay' service, health & wellness vending machines, and first ever dedicated website for store brands. Notes from my fireside chats with some of the most talented professionals in the consumer industries responsible for driving digital transformation for their brands. Sephora & Ulta Beauty – How They Are Leaving Other Retailers in the Dust. For all the talk of an imploding retail industry, two retailers have proven that with the right strategies and proper execution, the retail model can thrive. Why Sephora & Ulta Beauty are putting other retailers to shame. Small and mid size restaurants fail to exploit the rich trove of customer data they possess to improve business performance. Let’s debunk 3 myths that stop them from doing so. This week: Contactless payment capability in smartwatch, Reserve online Try in-store feature and chatbot to help jeans buyers find the right fit. This week: Live community chat on online product page, new AR concept salon and visual search feature for fashion retailer's app. This week: Digital community for loyal cosmetics' customers, expansion of scan & go capability for retail giant and chat feature for taxi app. This week: Experiential store that transforms every six weeks, fast-fashion vending machines & pizza chain's first loyalty program. This week: RFID enabled Smart Table, visual search features for e-commerce retailer's app and point-of-sale kiosks for toy retailer. A 3-year journey to find cure and care for a loved-one exposed me to the worst of the healthcare industry. Then, we visited the Mayo Clinic, and discovered an experience worth emulating for any consumer-centric business. This week: A shoppable social media feed, tech to detect unhappy customers and new concept store with high-tech beauty upgrades. This week: Beauty retailers launches lipstick advisor chatbot, back-to-school campaign on Snapchat and first national pizza brand to offer instant ordering on Facebook. Dave Weinand to Offer Leadership Team the Parental Supervision it Desperately Needs. This week: New echo-like device, social app adds feature to add links & voice filters and product sampling for online customers. This week: 3D kiosks with holographic capabilities in-store, dynamic video ads on social media app and new interactive displays in-store. This week: Upgraded image-based search engine, use of social media to enhance product development and a digitized new store concept. This week: "Physical showroom online shopping control" patent, touch screen kiosk in food chain and use of snapchat to recruit millennials. This week: a fully automated self-service kiosk, a new smart speaker, 'HomePod' & new AR features in beauty retailer's app. This week: Patent for parachute-dropping drone, VR-based instructions for employee training and revamped department to simplify shopping experience. This week: an at-home eye examination via mobile app, payments with a simple wave of the hand and customizable direct message cards on social media. This week: Robotic suit as uniform for employees, Augmented reality ads on social media and new brick-and-mortar retail format, Riley Rose. This week: 360-degree virtual reality experience on web, Mother's day gift delivery via Robots and delivery status updates on Alexa. This week: In-store QR code rewards, pizza delivery alerts on your smart-devices, and fitting-room to online cart in a jiffy. This week: US retailer shows Europeans the love, a voice assisted stylist, and an RFID-based point of sale. This week: "Camera Effects" Augmented Reality Platform, beacons to improve order accuracy, and a chatbot virtual stylist. As retailers continue to invest in transformation, they must focus on a more certain path to customer relevance and be alert to the distraction a me-too, competitive-parity based omnichannel approach poses. This week: A color recognition chatbot, data democracy for C-store employees, and a 1600-store RFID deployment. The 7 types of players to watch as ecommerce penetration in the eat-at-home takeout foodservice category grows at an exponential rate. Consumers are more complex than a linear 5-step process. Retailers and brands must be smarter than to box shoppers, and their customer engagement strategy, into a decades old construct that no longer holds true. This week: 'Order-ahead' coffee via your navigation app, sidewalk robots for pizza delivery, and an AR app for in-store navigation. A New Breed of April Fools. Founding a new business on the day the world is busy getting pranked is a masterstroke. Or, is it? An exciting new insights provider for consumer industries is born, and says its first words. Retailers playing a "defense-as-offense" omnichannel strategy run the risk of distracting themselves from what will ultimately make them successful - a clear customer experience strategy executed profitably. Incisiv offers digital transformation insights for consumer industries.